The World’s Most Expensive Dowels!! Yesterday I took the afternoon off and headed up to our house to do some projects in my shop. I had some sanding to finish up on the loft beds I’ve been building, I built some drawer spice holders for my brother and I made some dowels from scratch. The drive up the parkway is beautiful. The temptation to speed is great. But given all my tickets, I usually set the cruise control and glide along. Usually, but traffic was flying. You know the theory about if you drive with the traffic you won’t get pulled over? Well that was just disproven. Speed trap+ 20 cops + 80mph = another ticket. I designed some dowels into my latest project and was quite proud of myself, for incorporating a new technique, new to me at least. But it is funny how we absorb information. Part of me had it in my head, that I had somehow come up with it on my own. Anyway, I finally took out the Lie Nielson Dowel making plate I had bought last year (it was was one of those purchases that I added on to an order and thought “I really need this!”) dusted it off and made a little jig. I struggled a little bit as my pieces weren’t small enough, and I ended up breaking a few. So I did what all good modern woodworkers do, I hit the internet. Googled Lie Nielson Dowel making video and there popped up Marc Spagnuolo and his video on Drawboard Mortise and Tenon. Damn! How do these ideas get in my head!!! Oh right. Back to the bench I cut my maple pieces down to a more realistic, manageable sizes. 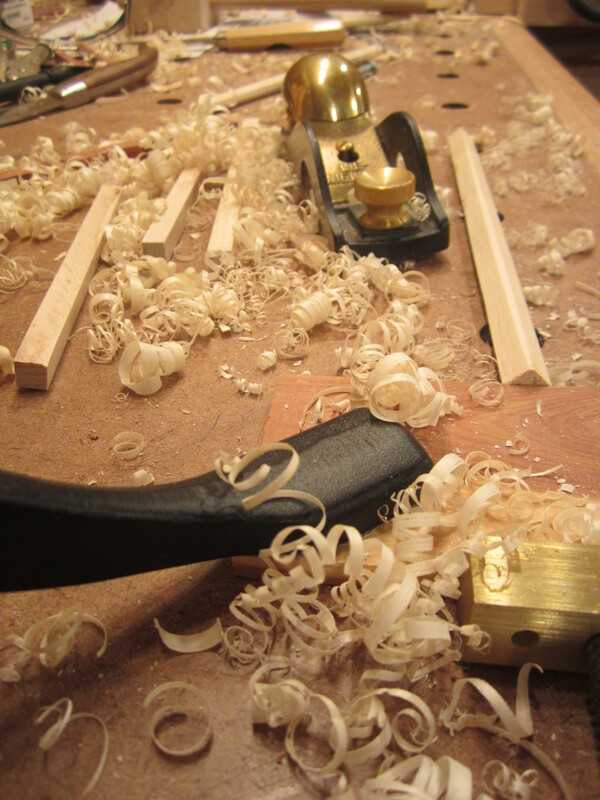 I then broke out my block plane and took the corners off. Next I cut those pieces into 6″ lengths. I learned earlier that a longer piece has a greater chance of breaking as it gets hammered in. 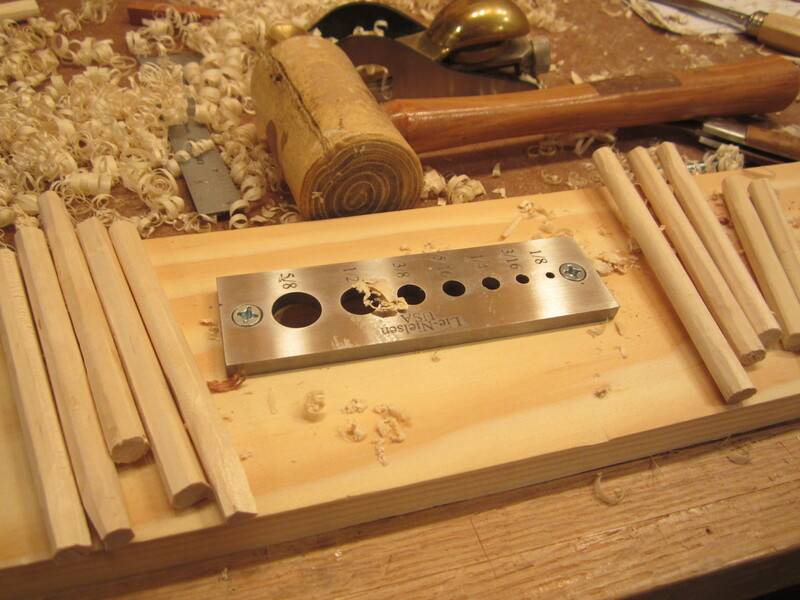 I used my leather bound mallet to drive the pegs through the holes and voilà! I made a dowel! Proud of myself, I emailed my wife to show her pictures. She responded back: “The worlds most expensive dowels!” She was right, by the time you add up the 280 miles round trip worth of gas, the speeding ticket, the lawyer to get out of the ticket, and of course all the tools I “had to have”, well yes I guess those are some pretty expensive dowels. Did I mention I also built a spice rack? 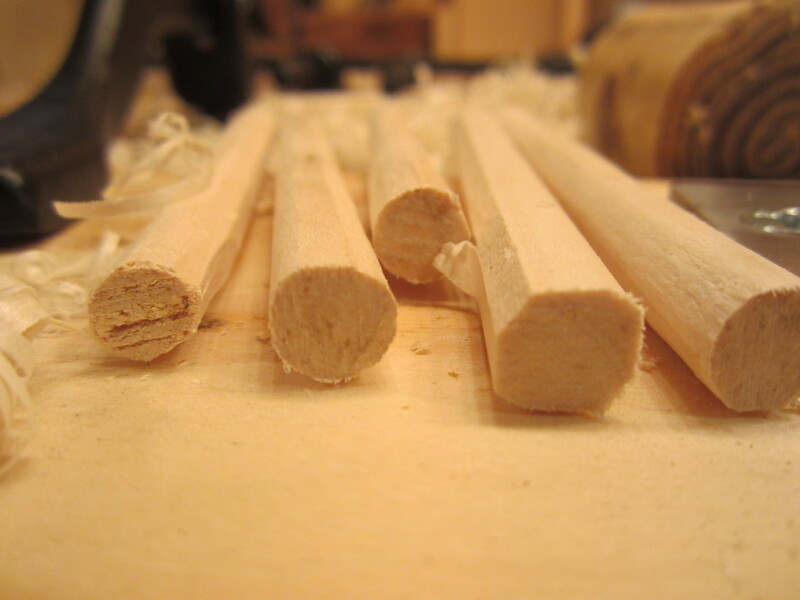 Here’s another great video on dowel making and a nice jig. 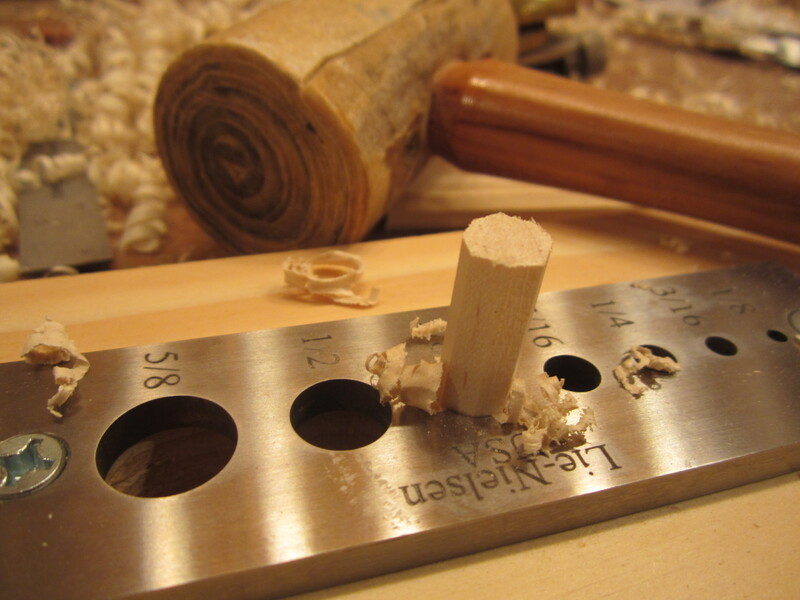 This entry was posted in Inspiration, Process and tagged Dowels by Christopher Landy. Bookmark the permalink. I’ve started running the Waze app on my phone ANYTIME I’m driving. It always gives me a heads up about the speed traps – it’s awesome. It’s saved me lots of $$ and I feel good when I report a speed trap for my fellow Wazers. Unfortunately, I too have many “Most expensive _____ ever” stories along the same vein. 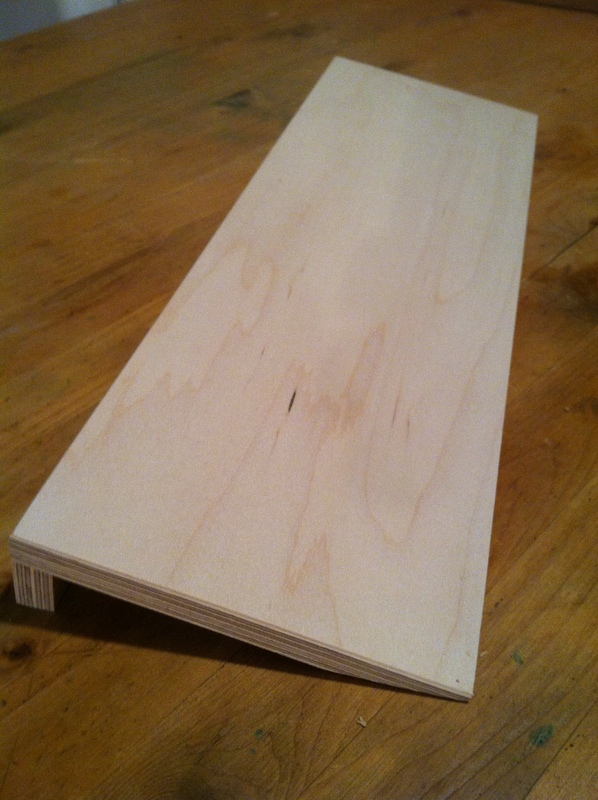 Another option for prepping your dowel stock: I made a small dowel stock prepping jig – it’s just a piece of flat plywood (6″W x 24″L) with a 45 degree vee cut in it. I rip the dowel stock to about 1/32 over the desired dowel diameter, then I can take that stock and rest it in the V-notch and run it through the planer to take off the corners so it ends up as a perfect octagon. Before I came up with this method I always ended up with flat spots on my dowels from places that I had planed away too much of the corner. I’ve made 15″ long dowels with this system. Yea–We usually run Waze on my wife’s phone for traffic only. Need to rethink that! I thought of doing the V jig, even to plane them by hand. But ou know how time and jigs are sometimes approached. I did enjoy the ideal of dowels such as this and can see me incorporating them into my joinery in the future. thanks for reminding me–I have to deal with that ticket! They may be expensive $ wise , but the real value is in the gratification of the accomplishment….not to mentioned being away from your NYC life and work, breathing clean, fresh air! Some things you can’t put a price on! Saratoga? ?